By Benjamin Neil Atchie, D.O. Hereditary hemorrhagic telengectasia (HHT), also known as Osler-Weber-Rendu disease, is an autosomal dominant disorder which predisposes patients to various vascular abnormalities. These vascular abnormalities classically include telangiectasias involving the mucosal membranes of the nose and gastrointestinal tract. Other common manifestations include arteriovenous malformations (AVMs) of the pulmonary, hepatic, and central nervous system (CNS) vasculature. Epistaxis secondary to the telangiectasias involving the nasal mucosa is the most common clinical presentation of HHT and can often be challenging to manage. The lateral digital subtraction angiographic images (A and B) presented above, acquired from bilateral common carotid artery injections, demonstrate the patchy nasal mucosal blushing characteristic of telangiectasias. 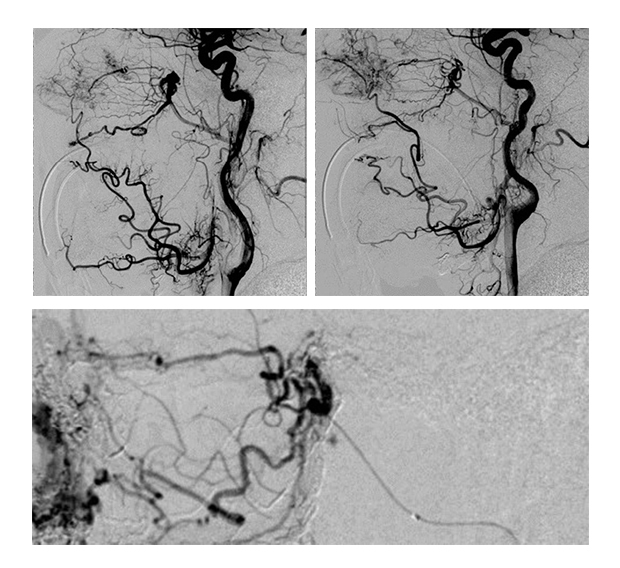 The coned down image (C) is from selective micro-catheter injection into the distal internal maxillary artery, obtained during Onyx® embolization for recurrent epistaxis in a 67-year-old man with HHT requiring multiple transfusions. Endovascular embolization for epistaxis is a reasonable option for patients who fail more conservative management with nasal packing and endoscopic cautery. Multiple techniques with various types of embolic material have been described, perhaps the most common of which is embolization with polyvinyl alcohol (PVA) particles. However, other options include microspheres, gelfoam, coils, and liquid embolics such as Onyx® (EV3 Irvine, California, USA). Atchie BN. At the Viewbox: Hereditary Hemorrhagic Telangiectasia. J Am Osteopath Coll Radiol. 2014;3(3):26.